For the Australian historian of computing, see Allan Bromley (historian). 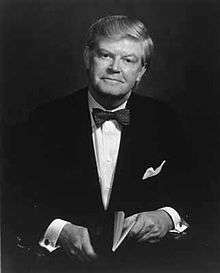 David Allan Bromley (May 4, 1926 – February 10, 2005) was a Canadian-American physicist, academic administrator and Science Advisor to American president George H. W. Bush. His field of research was the study of low-energy nuclear reactions and structure using heavy ion beams. Born in Westmeath, Ontario, Canada, he received a Bachelor of Science in 1949 and a Master of Science in 1950 from Queen's University. He received a M.S. and a Ph.D. degree in Nuclear Physics in 1952 from the University of Rochester. From 1952 to 1953, he was an Instructor and from 1953 to 1954, he was an Assistant Professor at the University of Rochester. In 1955, he was hired as an Associate Research Officer, Atomic Energy of Canada Ltd. and from 1958 to 1960, he was a Senior Research Officer and Section Head. In 1960, he moved to the United States to become an Associate Professor of Physics at Yale University. He became a U.S. citizen in 1970. He was appointed a Professor in 1961 and was Associate Director of the Heavy Ion Accelerator Lab from 1960 to 1963. He was the founder, and from 1963 to 1989, the Director, of Yale's A. W. Wright Nuclear Structure Lab. From 1970 to 1977, he was Chairman of the Physics Department. In 1972, he was appointed the Henry Ford II Professor of Physics and was in this position until 1993. He was then appointed the first Sterling Professor of the Sciences. Before being appointed to the Bush Cabinet, he was a member of President Ronald Reagan's White House Science Council. While serving as Bush's science advisor from 1989 to 1993, he pushed for major increases in scientific research funding so that the United States could compete with Japan and Germany in manufacturing. He also supported the expansion of the high-speed network which eventually became the Internet. Following his public policy work, he returned to Yale University to serve as Sterling Professor of the Sciences and Dean of the Yale Faculty of Engineering from 1994-2000. His tenure as dean substantially revived Yale's engineering programs and led to its re-establishment as the Yale School of Engineering & Applied Science. He continued teaching at Yale until his death in 2005. Over his career, he had many honors including 33 honorary degrees and membership in the United States National Academy of Science and the American Academy of Arts and Sciences. In 1988, Bromley was awarded the National Medal of Science. Bromley, DA; Feshbach, H; Garvey, GT; Hyde, E; Keller, OL; Weneser, J (1978). "Physicists Postpone Visit to Soviet Union". Science. 200 (4347): 1220–1222. Bibcode:1978Sci...200.1220B. doi:10.1126/science.200.4347.1220. PMID 17738700. Bromley, DA (1980). "Physics". Science. 209 (4452): 110–121. Bibcode:1980Sci...209..110B. doi:10.1126/science.209.4452.110. PMID 17836565. Bromley, DA (1981). "The Fate of the Seed Corn". Science. 213 (4504): 159. Bibcode:1981Sci...213..159B. doi:10.1126/science.213.4504.159. PMID 17782758. Bromley, DA (1981). "Echoes of Toronto". Science. 213 (4512): 1063. Bibcode:1981Sci...213.1063B. doi:10.1126/science.213.4512.1063. PMID 17741081. Bromley, DA (1982). "The Other Frontiers of Science". Science. 215 (4536): 1035–1044. Bibcode:1982Sci...215.1035B. doi:10.1126/science.215.4536.1035. PMID 17771820. ↑ "D. Allan Bromley, 79, Physicist Who Devised National Science Policy for the First President Bush, Dies". NY Times. 13 February 2005. ↑ Fellman, Bruce (April 2002). "Rebuilding Engineering". Yale Alumni Magazine. Retrieved 18 March 2015. "Canadian Who's Who, 1997 Edition on the Web". University of Toronto Press. 1997. Retrieved 2009-08-24. Casten, RF; Lane, N (2005). "David Allan Bromley". Physics Today. 58 (9): 73–74. Bibcode:2005PhT....58i..73C. doi:10.1063/1.2117834.